Coaching is one of those things that a lot of people aren’t sure about. While most of the world’s successful people have coaches, you might still wonder how relevant a coach would be to you and your team. We all need wise council from time to time. Business can be complicated and fast paced, and trying to lead a change in behaviour at work can lead to levels of frustration when that change is not sustainable. Our approach to facilitating behaviour change in the workplace starts with how the team thinks. We look at understanding and bridging the gap in thinking between now and where you want your team to be. We identify the factors that influence the direction of a teams behaviour and performance, and using Meta Dynamics™- the world’s first and only proven, research based coaching methodology developed by Sharon Pearson – we reinvent the way the team thinks, acts and behaves. Support your planning efforts by developing appropriate strategies to engage and inspire your team in narrowing their focus on achieving your desired goals. Build flexibility into your teams thinking so they can embrace uncertainty and challenges with new levels of confidence, agility and emotional resilience. Address workplace conflict, attract and retain the best people, understand individual motivators, and leverage team strengths and relationships. We help leaders identify gaps in their teams thinking so they can approach team challenges in a different way. Using the four thinking dimensions within the ESIP Critical Alignment Model, we identify where the challenges lie and where the gaps in thinking, communication and actions are. While tough times breed great leaders, it’s important to remember a great quote by Einstein when tackling business challenges“we can’t solve our problems with the same thinking we used when we created them”. Unfortunately not many of us are taught how to think so having a model that provides a disciplined and structured approach to the four thinking behaviours is extraordinary. 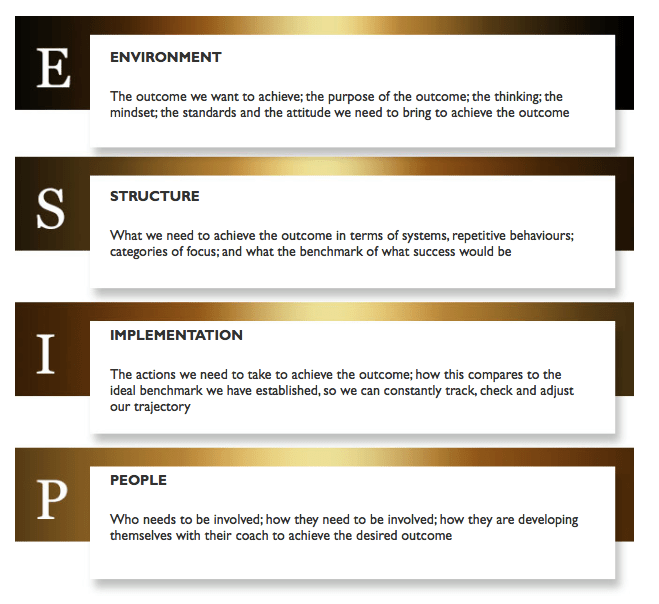 The ESIP Critial Alignment Model provides a profound framework of knowing which direction to focus on first. It has allowed many leaders to embed sustainable changes within their teams, and it has allowed teams to develop independence from leadership. We offer private one-on-one sessions with leaders to assist in building greater knowledge around behavioural patterns, while team sessions assist in building a culture of accountablity, respect and trust. Meeting face to face increases the level of engagement, and by removing yourself from your own environment to a neutral space, face to face sessions can also provide a different perspective. Enjoy the benefit of connecting remotely from the comfort of your home or work while still maintaining a visual link despite time zones, distance and location. Phone sessions are effective and convenient because they reduce visual distractions by physical actions or appearances so you can focus on hearing the conversation in a deeper way. Laser sessions are a short conversations (10-15mins) between normal sessions that addresses a specific roadblock or targets a core problem or challenge that requires immediate attention. Group coaching is a recommended follow up to training to support the transfer and application of new knowledge as well as creating an on-going accountability structure.